The concept of chivalry as a military code of ethics is sometimes dismissed as simply an excuse for causing harm and doing violence under the guise of righteousness. 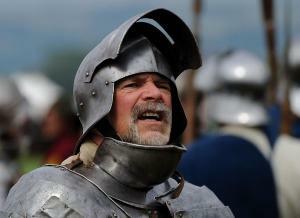 In fact, in many of Chivalry Today’s presentations, audience members (of all ages) openly scoff at the notion of a medieval knight as an “ethical soldier” who has respect for “rules of engagement.” Sadly, many people have come to believe that a soldier’s code of conduct is merely a pretty mask put over an ugly truth: That warriors in the Middle Ages took pride and pleasure in harming other people, and embraced any excuse to do so. But new research from the University of Copenhagen indicates something very different: That chivalry may, in fact, have reflected knights’ desire to refrain from killing and hurting other people needlessly. In fact, this study of authentic medieval accounts and chronicles reveals that knights and soldiers of the Middle Ages may have been acutely aware of the causes and symptoms of Post-Traumatic Stress Disorder, and looked (in part) to the principles of the code of chivalry as a means of protecting themselves from the psychological aftermath of battle. Of course, there were no combat psychologists following knights on the Crusades or in the Hundred Years War – but as this article by Kristian Sjøgren, originally published in the Danish science journal Science Nordic shows, medieval soldiers may have been more aware of the mental risks of combat and warfare than was previously believed – and chivalry might have been their armor against PTSD.